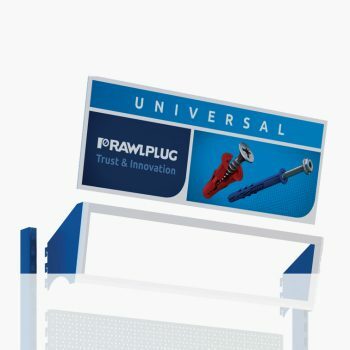 Rawlplug’s POS system is a solution that enables you to create virtually any chosen combination of components. The secret is in the unique system modularity. 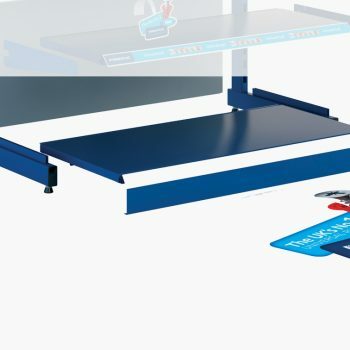 Combined with the vast selection of plates, tags or stickers, it provides a perfect platform for product presentation and highlighting, while on the other hand, it gives you just enough space to communicate key information and facilitate the right choice of products. 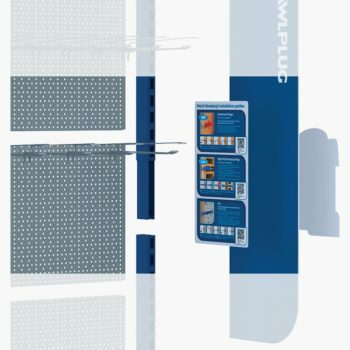 The system’s communication elements are product display accessories such as toppers (top panels), rigid side panels, side labels, outer side labels, inner labels, shelf wobblers, edge strips and floor stickers. Here you can read more about their advantages. 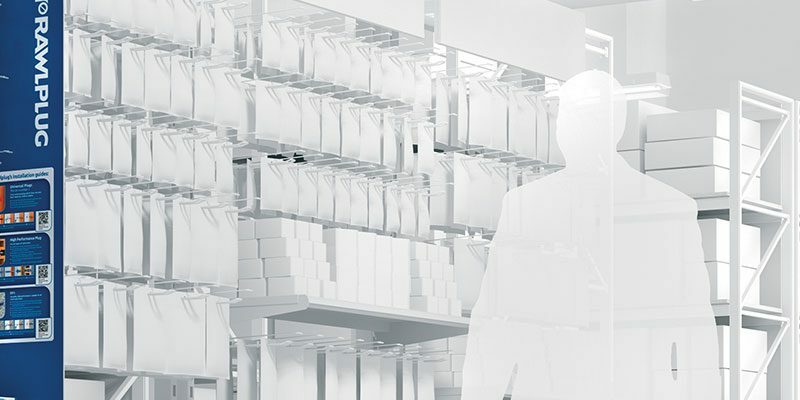 Their function is to highlight a specific group of products placed on the shelf. The topper colour pattern matches that of the individual product group. 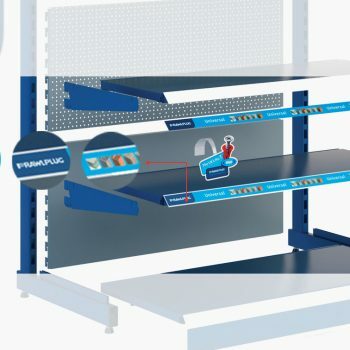 A panel which ensures sufficient rigidity of the rack is the right place to provide additional commercial product information, clearly emphasising the most crucial decision affecting aspects. Side labels contain additional product information, such as simple installation instructions or examples of specific product applications. They also provide attractive space for information concerning current sales promotions. The function of outer side labels is to communication information common to the given stand or a group of stands, such as current promotions or thematic campaigns. Inner labels are used to inform the customer about the product they will find on an adjacent shelf. 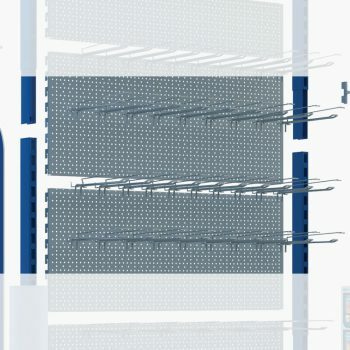 They also contain additional information, such as installation requirements, model applications or technical parameters provided in tables or diagrams. 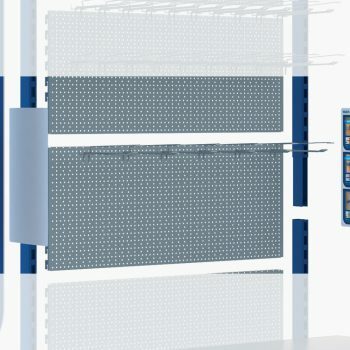 a flexible transparent extension arm that may be mounted to the chosen surface thanks to a special adhesive film. 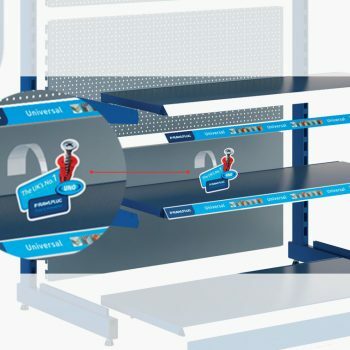 You can place a special strip on shelf edges, creating a perfect space for icons representing individual substrates with which the given product or product group can be used. This is also the right area to attach price tags or bar codes. 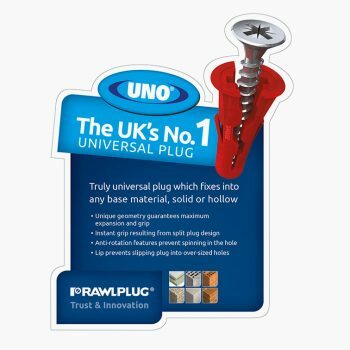 Generally these are multifunctional, as they can be used on other stand displays. Floor stickers may perform a double function. They can primarily highlight the most characteristic features of specific products, which may prove crucial when the client is about to make a purchase decision. And secondly, they attract customers’ attention by presenting current promotions.